There seems to be consternation at both the corporate and programming levels of Alternative Rock Radio as to the current state of the format - a radio format that historically has been known for its forward-thinking approach to music. Many I've spoken to in recent weeks have been concerned about the format's future. While there are exceptions - stations that are super serving the Alternative Rock fans - many programmers and management think the format can achieve greater ratings and revenue. Based on these conversations, a heightened state of alert is called for: DEFCON 3! Bridge Ratings provides research data to traditional radio including Alternative Rock stations. Part of the mix of research includes on-demand streaming data which we provide weekly to Alternative Rock programmers. On-demand streaming data has rapidly grown into a key research tool for media this year and Alternative Rock Radio is a beneficiary of the insight we are gaining through this data. Based on four years of trending data we have seen the format in many cases is misaligned with actual music consumption by its potential audience. 1) The rating system (Nielsen's PPM) that is industry currency for projecting radio audience is flawed when it comes to accurately representing Alternative Rock listeners. P1 listeners - those that contribute the most listening - have a tendency not to participate in Nielsen studies. P2 listeners are more likely to carry a people meter, but don't consume as much radio as primary listeners. The fact that the core audience for Alternative Rock radio is under-represented by Nielsen is at the core of the format's perceived problems. 2) If under-represented in the ratings, reported listening by core listeners to Alternative Rock radio is shaping an incomplete understanding of the available audience that is spending time with the format. 3) Alternative Rock radio has at least two paths to consider: a) continue programming to the format's core or b) to perform better in Nielsen, reflect the music consumption tastes of those who are likely to be represented in such studies. In order to perform better with People Meter measurement, more individual listeners (e.g. weekly cume audience) are needed. Secondary or P2 listeners may provide some insight as to the format's ability to attract more audience. More on this in a moment. 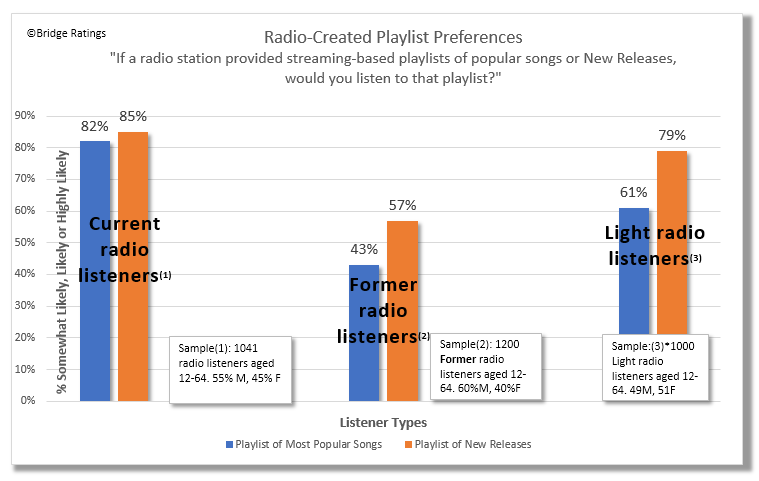 4) Our studies reveal that the Alternative radio audience that is likely to be reflected in Nielsen are seeking more familiar songs. This is evident by looking at our weekly on-demand streaming data. This audience uses radio and on-line streaming platforms in a symbiotic way. When compiling playlists for on-line listening there are two primary ways the Alternative radio life-group builds them. 1) Familiar favorites and 2) Music discovery. The portion of the Alternative rock life-group that would listen to the radio is very different from those who don't or seldom do listen. So to grow Alternative radio must appeal to this group. When this life group seeks these types of songs - primarily in the car - familiarity is the main reason, followed closely by discovery. 3) Don't underestimate the power of catalogue material. 67% of songs streamed on-demand by the format's listeners is library-based gold. 4) Don't program current music by consensus. Programmers who use published charts to stay aligned with the format's fast-moving audience are doomed. Published charts are based on dozens of stations and doesn't take local variances into consideration. Published charts do not reflect today's actual consumption behaviors. Chart positions on published airplay charts do not correlate highly with actual on-demand streaming data. This chart places Alternative as the lowest in correlation between actual airplay and on-demand streaming consumption. 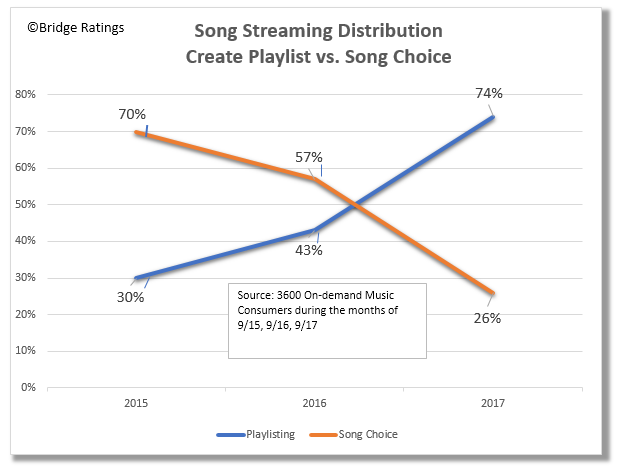 Only 35% of the songs on published airplay charts correlate by rank with actual consumption measured through on-demand streaming charts. Referencing published airplay charts as a programming tool will produce a playlist not aligned with the audience. 5) Not all markets are the same. When comparing station airplay with on-demand streaming data, we see significant variances in the most-popular current songs and artists market to market. Some songs by high profile format artists may not be right for power rotations. As Alternative Rock core artists have become more popular through exposure on streaming services and word-of-mouth they have also been adopted by competitive radio formats such as Top 40 and Hot Adult Contemporary. Twenty-One Pilots, Imagine Dragons and X-Ambassadors were formerly exclusive Alternative Rock radio artists have crossed-over to more mainstream listenership. As songs from artists like these are exposed first on Alternative Rock radio and then on Top 40, the streaming audience evolves and expands. This is a key point for Alternative Rock programmers to understand. "Heathens" by Twenty One Pilots is a good example of how a song evolves. When launched in April 2016 "Heathens" was exclusively streamed by Alternative Rock core listeners. 75% of streams for that song were from the format's core listeners and 25% were from secondary listeners. The song reached a more mainstream audience in June 2016 when it was featured in the movie soundtrack for "Suicide Squad". The song gained a wider audience during the band's appearance on Saturday Night Live that fall. As the song and the band received more exposure, the complexion of the streaming audience changed as depicted in the following chart. While still consuming the song heavily, over time, fewer Alternative Rock core listeners streamed "Heathens" as much but more Alternative secondary listeners began streaming the song more often as well as listeners to Top 40 radio which by the fall of 2016 was playing the song heavily. Considering this process of songs evolving through various music consumers is a new key element for radio programmers. A mass appeal hit by an Alternative Rock artist is good for the format; it can broaden and increase weekly listenership. 6) 25-30% of the top 75 most-streamed songs in most markets are not even on published charts. If stations properly reflected actual music consumption through on-demand streaming data, they would enhance the image of a station that is cutting-edge. 7) Reflect the audience's taste. They are there to lead you - not the other way around. Bottom line: Alternative Rock Radio serves an audience keenly interested in both music discovery and their favorites. Evidence of this resides in the behavior of these music consumers on social media and streaming services. If the format reflects actual music consumption and ignores programming by consensus, we can return the DEFCON level to 5 (the lowest state of readiness) because it will increase daily listening occasions as well as cume. To find out more about Bridge Ratings' station-specific on-demand streaming data, contact Dave Van Dyke at 323.696.0967 or at dvd@bridgeratings.com.